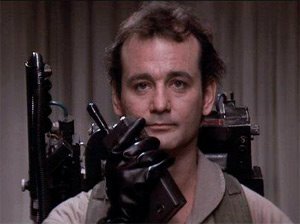 Bill Murray isn’t tight-lipped about his disinterest in returning as Dr. Peter Venkman for Ghostbusters 3, but a recent story published by The National Enquirer (yes, that National Enquirer), suggests that Murray finally received the script for review…and returned it to fellow ‘busters Dan Aykroyd and Harold Ramis in shreds. Since this story comes from the Enquirer, we should all probably take it with a grain of salt. Then again, where’s the fun in that? Time to speculate and exacerbate! Human sacrifice, dogs and cats living together, MASS HYSTERIA! Accompanying the purportedly shredded script—penned by Office writers Lee Eisenberg and Gene Stupnitsky—was a note that read quite bluntly, “No one wants to pay money to see fat, old men chasing ghosts!” Now, even though Aykroyd, Ramis and veteran Ghostbusters director Ivan Reitman claim that the film will go on with or without Murray, this news isn’t at all encouraging for those hoping for another sequel. As for me, I tend to agree with Bill on this one. Let it go, guys. For more on this story, head over to Screen Rant by clicking here.